And Makes The Dunes Move! Jeroen Bleekemolen has been doing great things in Spykers this year, and briefly in the DTM, but a last minute chance to drive the Dutch A1GP car at Zandvoort last weekend might be the turning point of his career. Jos Verstappen must have his own reasons for not taking up the drive in the second year of the A1GP – but missed out on a chance to race in front of 75,000 crazy Dutch fans. Bleekemolen jumped at the chance, led the Feature Race by 20 seconds, in changing conditions, and came home an excellent fourth. His overtaking around his home track was a sight to behold. The young Dutchman made his way to the front despite two pit stops, at the second of which he took on wets. The crowd cheered him on as if it was the World Cup (soccer), which it was in a way. When the rain stopped, the Dutch car remained on wets, and was overtaken by three cars which had pitted for slicks, but it was still a very special performance. 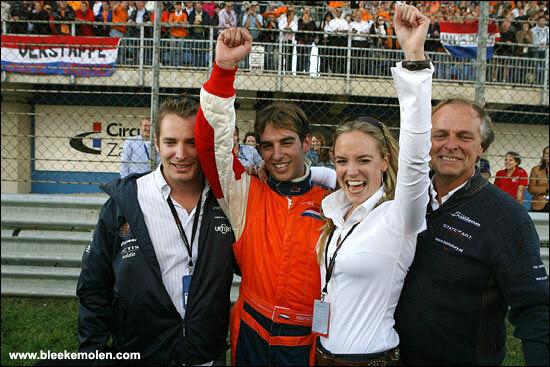 Well done Jan Lammers, and all the Dutch A1GP team. 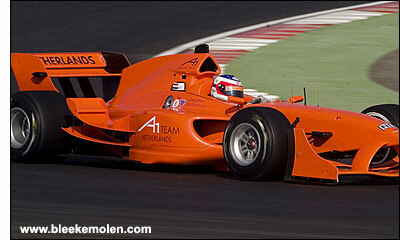 Jeroen Bleekemolen will be driving the Dutch car for the whole season.